A group of adolescent friends band together to fight against aliens that rule their planet. 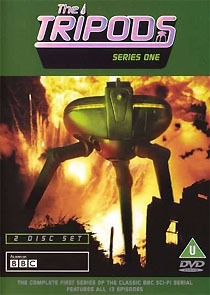 Based on the popular series of novels by John Christopher, The Tripods is set a hundred into the future, where a group of adolescent friends team up to fight against an alien race who have invaded their planet. The aliens, huge three-legged metallic creatures, have subjugated the human race for decades using mind-control devices. The friends travel from village to village, looking for like-minded rebels, dodging the authorities, and scheming against the invaders. The BBC made adapted The Tripods in 1984. They made thirteen twenty-five minute episodes, covering roughly a third of Christopher's epic story, but still spread the plot very thinly indeed. The dwindling number of viewers who persevered all the way to the end of the first series was rewarded by a more exiting second series, which saw our heroes enter the Tripod city. Second Sight, the company behind the impressive Vampyros Lesbos and She Killed in Ecstasy discs, have released the entire first season as a two-disc Region 0 set, in PAL format. Cramming almost three hours of aging full-frame videotaped material (the series was recorded on creaky 1” tape) onto each dual-layer disc risks an explosion of MPEG artefacts (as anyone who’s seen Carlton’s The Prisoner discs will testify), but the results here are surprisingly good. The picture lacks bite, and the black levels are a little inconsistent from shot to shot, but these are probably faults that are inherited from the original masters. The audio is mono (presented at 192kbps), and is typically restrained. This two discs contains the same episodes as the BBC’s early 90’s VHS release, (their plans for the release of the second series were scrapped after disappointing sales). It seems that the second series is ill-fated, because Second Sight was keen to release the second series, but have been foiled by contractual problems, which is a great shame for fans of the books, and fans of BBC science fiction series. Incidentally, don’t be misled by the photo’s on the back of the sleeve – three of them are from the second series!